A little rock tumbling took place over the holidays. We've been studying rocks and minerals and thought getting a rock tumbler for Christmas might be fun. Well, who knew, first of all, how loud those suckers are, and second of all, that they would take a minimum of 9-11 days to tumble! Loudly! Out to the garage that little tumbler went. And it tumbled and tumbled and tumbled...for nearly 2 weeks. But it did produce some rather lovely rocks. Which we turned into rings, necklaces, keychains and earrings. For our first tumbling experiment we used the rocks that came with the machine. But, after seeing the results, we've decided to try tumbling some of the rocks we've collected over the past few years from the various rivers in the area. We picked up jars full of lovely purplish glittery rocks by the Pedernales last spring (that's scientific, right? ), and have jars full of rocks from the Frio and Guadalupe as well. We'll throw some of those into the tumbler next and see what happens! Hey, learning is learning, eh? Even when it tastes yummy. We took a field trip to our local science museum recently. However, on the same day (imagine!) our favorite local cupcake shop just happened to be having a $1/cupcake sale. Well, we couldn't pass that up. After our children's store closed last year we had lots of educational kits left over that we weren't able to sell in time. One of them just happened to be a kit for making mummies. Little did I know 10 months later I'd be homeschooling, studying mummies and such, in need of such a kit. So when project time came around during our Egyptian studies, we ripped that sucker open and worked our way thru. We assembled and painted a cardboard pyramid, using paint mixed with sand, to give it the texture of limestone bricks. Then the girls mummified the little skeletal dude that came with the kit. And the tomb. And set it in the sun to dry. They gave the tomb a coat of gold paint and added stickers and other various embellishments, and laid the mummy dude to rest. 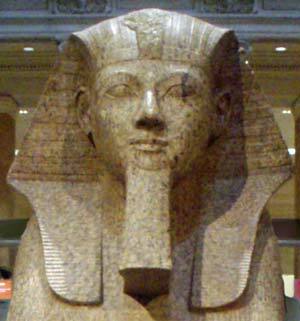 Actually, I like to think it's a she...perhaps it's Queen Hatshepsut herself. RIP little lady dude. I feel like we could have done alot more with our Egyptian studies. But since we're still babystepping into this whole new world of homeschooling, I feel like we did OK for a first run. I have to admit, the unit studies intimidate me a little, so I stayed away from going too far in depth, but I did find some neat lapbook ideas during my google searches that I think we'll check out and work on for our next major history section. I'm inspired! Plus, it's fun. 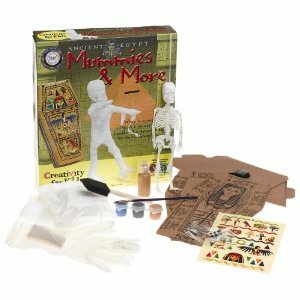 And FYI, the name of the kit we used is called Mummies and More, by Creativity for Kids. Good stuff, and kept the attention of both the 1st grader and the 4th grader. Up next, those naughty Greeks! Our library haul this week. We're still working thru Egypt. Though we're finally in New Egypt, which means King Tut and Queen Hatshepsut are on deck. I actually find Hatshepsut a rather fascinating gal so I picked up an extra book on her. Next week we move on to more Bible stories regarding Moses and Jonah so I picked up a few reference books along those lines, along with a few videos of King Tut and the pyramids. I even threw in a theater book. What can I say, it's winter. And for myself: The Five People You Meet in Heaven, Interpreter of Maladies, and....Radical Homemakers...Hey, I'm at least consistent with my inconsistencies. The girls are still working thru a combination of library books and on-hand chapter books. We definitely check out more than we finish, but at least we give it a go. 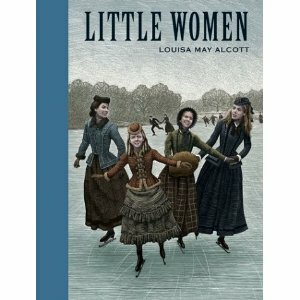 We've decided to also start reading together as a family, so I picked up a copy of Little Women to start with. Not sure how the man will feel about it, but it's something I think us gals will enjoy reading together. Maybe we'll let him pick the next book. Maybe. The house building continues...the man took on the job of gluing the shingles on. And we decided to convert the front porch roof into a second story balcony instead. We'll have to do a search online to find more posts and porch railing, but I think it gives the house some character, and well, that's what we would do if we were building a real house. I decided to add some flowers to the flower boxes. Pretty. If only my flower boxes could look like that. Wait, do I have flower boxes? So, here's how the inside is looking. Most of the rooms have wallpaper, which is basically scrapbook paper that is decoupaged on. I also put a second layer of decoupage on top of the paper to seal it. The girls wanted carpet in the bedrooms, so we put carpet over the hardwoods. I'm told these are the Pre-Teen rooms, hence the rock star guitar and dorm-room style bedding. Truth is, we haven't had a chance to purchase furniture for the house and decided we would find pieces over the year, rather than all at once. We also want to buy as much used or vintage as we can, so for now the girls moved in all the furniture that came with their Little Pet Shop critters and other various dollhouse items we've had from previous houses. We'll be knitting up some rugs and sewing up bedding and pillows soon. And I think some curtains are in order. This is the nursery. Ya know, for the baby critters. I think this is a study of some sort. Looks like this poodle is claiming it. The kitchen needs some work. I'm sure the animals don't mind their toast coming from a wheelbarrow, but I'm thinking some sort of countertop/sink area is in order. At least the chicken is still around. Note the key to the front door on the mantle. It's a sweet cozy little home. For animals. And someday if our kiddos have kiddos of their own, they can pass along this cozy little animal house on to them. Our Vermont Farmhouse. It started out in a flat box filled with bits and pieces. Amazing what a difference a little glue can make to a bunch of bits and pieces. And all those bits and pieces needed to be painted. By hand. Thankfully I had good helpers. Each piece required 3 coats. Each little window frame, each piece of trim, the shutters, the railing...even the main house. After a while it started to feel a bit like remodeling a real house. Sigh. If only. And strangely, every time I got one floor finished, furniture would suddenly appear in the room. But, but...the kitchen's not finished I would say, I still need to put in the windows and doors and baseboards and paint the ceiling and...is that a chicken? I read a wonderful book last year called Women Who Run with the Wolves, by Clarissa Pinkola Estes. Clarissa is a Jungian analyst who believes that "a woman's wholeness depends on her returning to the sources of her repressed instinctual nature"...in other words, her wild woman. 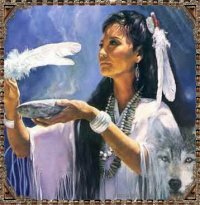 She compares healthy women to wolves (thru folklore and fairy tales) and talks alot about finding our intuitive selves. 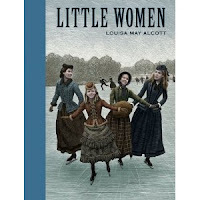 My first impression when I finished the book was that it was something I would give my girls when they graduated high school, to take with them to college or to read before they get married. Definitely one to have on the shelves, or pass along to friends. I took a few notes while I was reading the book and stumbled on these notes recently. A few are striking my fancy today because they are about solitude. I'm learning, as a new homeschooler, how to fit solitude into my days (it is possible, just takes a little shuffling), and noticing now much more relaxed I feel on the days when I make more of an effort. I'm still a work in progress when it comes to discovering my wild, intuitive, wolf-woman, but the older I get the more I understand how important the journey is. "Long ago the word alone was treated as two words, all one. To be all one meant to be wholly one, to be in oneness, either essentially or temporarily. That is precisely the goal of solitude, to be all one. It is the cure for the frazzled state so common to modern woman, the one that makes her, as the old saying goes, 'leap onto her horse and ride off in all directions.' In ancient times, solitude was used to heal fatigue and prevent weariness. It was also used as an oracle, as a way of listening to the inner self to solicit advice and guidance otherwise impossible to hear in the din of daily life." "My experience in analyzing women leads me to believe that much of modern woman's premenstrual crankiness is not just a physical syndrome but is equally attributable to her being thwarted in her need to take enough time to revivify and renew herself. I always laugh when I hear someone quoting early anthropologists who claimed the menstruating women of various tribes were considered 'unclean' and forced to leave the village until they were 'over it.' All women know that even if there were such a forced ritual exile, every single woman would, when her time came, leave the village hanging her head mournfully, at least till she was out of sight, and then suddenly break into a jig down the path, cackling all the way." Ha! Ya gotta love it. We're still working our way thru a few different arts n crafts books we picked up from the library. One project involved learning to mix colors and paint in gradients...and involved using potatoes as stamps. It was such a pretty day, we decided to move the project outside. The girls were quite proud of their sailboat paintings. Another project involved eggshells. We drew images onto cards made from construction paper and glued crushed eggshells on the cards. (I collect eggshells whenever I can for my tomato plants, the compost bin, for craft projects, and the rest I grind up into bonemeal for our homemade cat food). Once the glue was dry we painted the shell pictures. We try to only eat farm eggs now but I still keep the shells whenever I can. This particular bag of shells I've had in the pantry for over 2 years, just waiting for the right project. The girls decided they would mail their completed cards to their two grandmothers. A yellow finch (on pink) for their Nana, who adores those little yellow birds. And a turtle swimming in a stream for their Grammy who lives on a river in Colorado. And a pretty butterfly we worked on together, to hang on our art wall.